OurEnergyPolicy.org | Managing Energy Demand: Can We? Should We? Managing Energy Demand: Can We? Should We? Energy efficiency has been a lightning rod in the debate about the cost of addressing climate change, because it is generally seen as a least-cost approach to mitigating greenhouse gas emissions. But the mere mention of possible “negative costs” associated with energy efficiency is enough to send shock waves across the profession of neoclassical economics. Experts continue to disagree about the magnitude, cost and possibility of managing demand. Some say that the future potential for energy efficiency is limited because markets have already exploited all cost-effective opportunities, and there are insurmountable obstacles to further expansion. Demand-side resources may have played a role in the past, but they are now “tapped out.” Policies to promote more energy efficiency have failed, and any future efforts run the risk of expanding – not shrinking – energy consumption because demand “rebounds” with more energy-efficient products. In any event, savings from policies are too difficult to measure and monetize; as a result, energy efficiency is unreliable, unpredictable and unenforceable. Others argue that market failures abound, producing a large reservoir of energy efficiency opportunities waiting to be exploited. Policies have, and can in the future successfully address these obstacles, producing a vast improvement in the efficiency of energy use. The rebound of demand in response to energy efficiency may occur, but it is small and does not negate the value of efficiency investments. Measurement and verification practices are mature and have documented that energy efficiency is reliable, predictable and enforceable, and it minimizes the risks of supply-side investments. When energy efficiency skeptics prevail, expanding supply becomes the only way to meet increasing energy demand. Capital is diverted to large-scale projects, and unsustainable energy practices are amplified. When energy efficiency advocates prevail, new jobs in labor-intensive industries are created, but jobs at energy suppliers may erode. Do the benefits of energy efficiency programs outweigh the costs? 12 Responses to Managing Energy Demand: Can We? Should We? The comment “Some say that the future potential for energy efficiency is limited because markets have already exploited all cost-effective opportunities,” I think are talking about the Low Hanging Fruit applications. 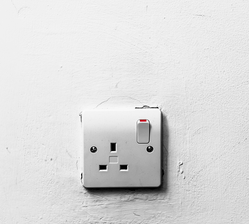 The picture in your article shows an electrical light switch? Our governments and utilities have done a great job at promoting Energy Efficiency. Most peoples eyes go to the ceiling, looking for another light bulb to change. This is good, but there is much more to becoming Energy Efficient. Natural gas is America’s other energy source. When talking Energy Efficiency, do you ever see eyes looking at the chimney poking out of the roofs of large commercial buildings and industry. Natural gas us used to heat these large facilities and to heat the domestic or swimming pool water. It’s also used to produce almost everything we use and consume all day- every day, including our food and beverages, fuel for transportation, building materials and glass products, clothing and leathers and plastics, and the list goes on and on….. Then there is the electricity to power those light in the ceiling and power computers and escalators and cash registers. How many chimneys are there poking out of the roofs of all these commercial buildings and industries and power plants across America? What is leaving most of those chimneys? How might all this wasted energy affect Climate Change, global warming and CO2 emissions? Why have their been no policies put in place to Increase Natural Gas Energy Efficiency? Instead of Hot exhaust leaving these chimneys, recover the heat energy and utilize it efficiently. Then being vented into the atmosphere will be Cool exhaust. A large measurable difference, and with this increased natural gas energy efficiency will be large number reductions of CO2 emissions. Again very measurable. America and the world is going to rely on a lot of energy for many decades yet. Increasing Energy Efficiency will create many jobs, and these jobs will inturn create many more jobs. Will America ever catch up to where we are so efficient that there will be no more Increasing Energy Efficiency jobs. I don’t think so. The buzzwords “Best Available Technology” are sought in many aspects of environmental regulation. Their purpose is to delay, make uncertain or difficult, or even to kill a technology for which they do not have the votes to kill outright. They first showed up mightily in the Clean Air Act and the Water Quality Act in the 1970’s. They allow no consideration of cost or long-term reliability, and what one regulator deems to be “best” may not even be fully tested in commercial applications. “Energy Efficiency” is a short cut for the Second Law of Thermodynamics: Entropy. It is ignored in economic analyses and in the role of government. If government approves of “Smart” meters and transmission and allows its capitalization, and rate design reflects entropy, then we have a fairly good mimic of the market, as per Alfred Kahn. For instance, if a wind farm and cable in the ocean allows the connection of an Island, which has relied on diesel generation, to mainland generation, the market may totally change. If regulation does not respond to the new price signals, including externalities, then it will give improper price signals and entropy will be increased. Suggest that the bottom line can be modeled by an independent committee of experts, including those who usually ignore each other, e.g. accountants, economists, engineers, physicists, and of course the people who makes law: lawyers. The criteria for picking the committee (by a high level government person/committee) would be both expertise and people skills – it does no good if you are a great economist, if you rub people the wrong way: Summers. My draft proposal: “External Entropy”, which seeks to reconcile and quantify entropy with economics and theology, is available for feedback or comment. Contact at etbi@live.com or call (401)439-0003. In U.S. utility ratepayer programs, energy efficiency programs have to pass cost-benefit tests. While there are variations of such tests, very few include non-energy benefits including environmental benefits, so they can be viewed as undervaluing energy efficiency . Yet, something like $6-7 billion in ratepayer programs have passed cost-benefit muster in 2012. Colleagues at ACEEE and elsewhere have conducted state-level electricity efficiency potential studies often finding 1.5-2.0% annual savings economically available. Further, states such as California and Massachusetts continue to find cost-effective opportunities though one may have thought the “low hanging fruit” would have been plucked already; albeit those areas have higher utility rates than many other areas (but lower average bills than many other areas due to both efficiency measures and weather). U.S. appliance and equipment efficiency standards have to meet cost-effectiveness criteria. Recent proposed standards for such products as commercial refrigeration equipments, electric motors, and metal halide lamps show strong cost-effectiveness. Energy service companies continue to make a living doing energy savings performance contracts. And vehicle manufacturers are progressing to meet and do better than upcoming fuel economy standards. Dr. Brown notes the argument of market failures. These abound in the energy arena. Foremost are externality costs, including significant environmental costs of our energy systems. But there are other failures too such as the classic landlord-tenant problem (often the landlord owns the capital, tenant pays the utility bill) or split incentives in business (e.g., where energy is treated as an “overhead” cost rather than being charged to particular business lines; or, another e.g., accounting artifacts that impede life-cycle costing of investments). Or that in applying for a mortgage, the underwriters care about your prospective insurance and property tax costs but not your energy costs that may be a larger consideration in the affordability of a property and risk of default. Uncertain and asymmetric information also clouds decisionmaking–should a homeowner trust a contractor claiming that duct sealing or adding insulation will save money? Certainly there are physical limits to efficiency in some circumstances–you’re not going wring a lot more out of a 97% efficient residential condensing natural gas furnace (though you may be able to get more systemically from duct sealing, building shell, smarter thermostats, efficient furnace fans,…) and the 75% improvement in refrigerator efficiency since the 1970s is unlikely to be replicated unless there is radical change in technology. But we’re nowhere near meeting our efficiency potential. Just one example is illustrated by Sid Abma above; the tremendous loss of energy from conventional boilers. In that case condensing boilers, waste heat recovery, and combined heat and power are options but even such things as better steam system maintenance, structural insulation, fixing leaks, and better combustion control can achieve good monetary as well as energy savings. I like either name … ‘First Fuel’, or ‘Fifth Fuel’ … as the CEO of Duke Power has called efficiency. The fact is that efficiency can create a 30% drop in electricity demand by 2030 … calculated by a lot of different organizations. There are lots of trees with fruit still available for picking. According to the USEIA … “Greater efficiency and structural changes in the economy have reduced energy intensity from 1950 to 2011 by 58% per real dollar of GDP.” The agency predicts further decline of 2% annually through 2040. But … there is an economic argument out there about what is actually shown when viewing the increased ‘energy intensity’ figures in the U.S.
Their question certainly sounds valid, but I would like to submit that the IEA’s projections for continued decline in energy intensity are actually low. Building’s account for 70% of our electricity use and Net-Zero buildings are on the way, not just in new buildings with better codes, but also in deep retrofits of older buildings. The Army is one place to look for what can be done. Here ‘energy intensity’ means energy use per square foot of building space. The goals established for Army bases all over the country should be called ‘sustainability’ goals because they involve energy, water and waste use. Two pilot bases, Fort Carson and Fort Bliss, are working on reductions in all areas with the goal of reaching Net-Zero by 2020. The Army’s overall goal is to reach Net Zero for all installations by 2050. That is not efficiency tapped out! Other positive results can be seen through the program of sustainability at CERES where major global companies have taken the ‘sustainability pledge’. These corporations see that efficiency saves money, creating larger profits. Deutsche Bank estimates that every dollar invested in building efficiency will produce three dollars worth of savings for building owners, adding $61/sq. ft. to the property’s sales value. In addition, for every kw/hr reduced at the building level, through efficiency or on-site production, 3 less kw/hrs need to be produced at the central facility. How can efficiency not be a good idea? The only thing that is required to find the economic expansion that efficiency promises is easy and accessible funding for building owners. PACE works, so does PPA’s. I believe we will see become commonly used in the immediate future. One has to be a little careful with semantics, energy efficiency means using less energy to product the same good or service, but energy efficiency is not necessarily economic efficiency. The reason is that by substituting other inputs for energy, such as capital investment, one can reduce energy but increase overall costs. As Rodney Sobin points out, non-energy benefits including environmental benefits should be included in determining overall economic efficiency of energy efficiency measures. The first best solution would be energy taxes that included the cost of dis-economies, raising the price of energy and providing a better signal for both energy consumption and investments in energy efficiency. However, in a second best world, subsidies can be used instead of taxes, but this raises the spectre of rent seeking, as actors invest in lobbying to get subsidies and thus we get similar distortions as we see in the tax code (renewable energy firms have a competitive advantage in lobbying over energy efficiency, explaining why we’ve made poor investments from a $/ton of CO2 perspective). A second reason for subsidies would be market failures, but this is a complex issue, while behavior economics and empirical studies suggests that residential customers don’t optimally invest in energy efficiency (for a number of reasons, but I suspect information is the primary problem, a secondary problem is finding reliable contractors, one important value of utility EE programs is the utility often acts as the monitor and sometimes the guarantor of contractor performance, reducing the burden on homeowners). As actors become larger, they have the sophistication to negotiate contracts with ESCOs, but even then for most industries and commercial establishments, energy inputs are a small percentage of total cost, making it hard to justify salary and benefits for energy efficiency management personnel, so energy issues fall to the bottom of corporate priorities without internal champions. EE standards have been knocked for being welfare reducing, but that assumes that customers are making rational choices, and that imposing efficiency on appliances and cars reduces consumer choice. In reality, consumers have limited information and limited ability to process energy consumption data, so it requires large price swings to cause significant changes in consumer choices in energy consuming capital goods, and even then there is a long lag as existing capital stocks have to be replaced – so in the case of dramatic price shocks, there will be a period of “excess consumption,” maintaining higher prices until the capital stock is replaced. Empirical evidence shows that energy efficiency standards have been far more effective than predicted. I think there’s a simple business logic, if consumers are insensitive to energy consumption, firms will compete on other attributes and on marketing. When energy efficiency is regulatory mandated, it creates a level playing field where each firm has an incentive to achieve efficiency improvements at the lowest possible cost, driving innovation. The mandate provides leverage for engineers against the marketing people within a firm, shifting investment to improved technology – and the result has often been a decline in cost/increase in quality (refrigerators, automobile engines) as investment in R&D pays off. The problem with standards is that it’s a guessing game, what level will promote the optimal level of innovation, and at what point does increased energy efficiency come at a serious decline in quality of services from the capital good and/or rapidly increasing cost of making the product. In conclusion, energy efficiency is a laudable goal, but economic efficiency should not be ignored in the pursuit of energy efficiency. If reduced energy consumption provides serious social benefits, this is a strong argument for increasing energy taxes to reduce consumption. Using multiple tools requiring careful examination how they interact to reduce overall costs of implementing an energy consumption reduction policy. Energy efficiency is certainly not tapped out. With power plants running at approximately 33% efficiency and internal combustion engines running at approximately 40% efficiency, great gains can be made in both the stationary and mobile sectors. However, the rebound effect (Javon’s Paradox) cannot be ignored. Ms. Twitmyer acknowledges the EIA’s analysis that energy intensity (energy use per square foot) has declined greatly; however, besides overall population increase is putting pressure on energy intensity, increased square footage of buildings has kept pace or increased energy use. 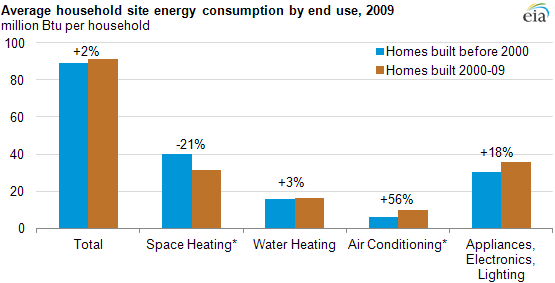 Only recently was EIA able to pronounce that the average energy consumption per home decreased but that needs to be reconciled with the fact that newer larger more efficient homes are consuming as much energy as older smaller less efficient homes. The rebound effect in housing might be expressed by larger homes. Certainly family size cannot account for the increase in home size over the past 40 years, according to the American Community Survey family size has reduced from 3.1 members per family in 1970 to 2.6 in 2007. With housing as an example of rebound, if efficiency in vehicles or energy generation increases, operating costs will be reduced but will behavior change and will we see an actual reduction in fossil fuel use or will it increase? When conducting a cost/benefit analysis of energy efficiency the rebound effect and its increased energy expenditure and increased carbon dioxide emissions need to be included in the costs of energy efficiency. Are you are ignoring what I believe to be the greatest energy efficiency improvement of all? The power generation industry has, through technology advancement, achieved thermal efficiencies of more than 60% for gas turbine combined cycle plants and over 35% for supercritical steam (Rankine Cycle) plants. This has been achieved in the competitive free market by use of higher temperatures (metallurgy) and better equipment design. For the time being, fossil fuel use does not seem to be a bad thing, at least natural gas and oil production are pulling the economy out of recession, and more of the money we spend for energy remains in the USA. Prosperity is not a bad thing. If fact, history shows us that prosperity will be greener than poverty. Forgive me, Mr. Shortt, I was including energy loss in transmission in my thoughts on energy efficiency from power generation. Unlike what conventional wisdom would suggest, the world economic growth is gradually decoupling from energy demand. As the latest BP Energy Outlook 2035, pointed out, global energy consumption has been growing at a slower rate than the global economy, and the discrepancy between the two is expected to become larger and larger as energy intensity continues to decline in the next two decades. The world has shown its ability to “do more with less”, and this trend is only more strongly demonstrated in the United States. As the U.S. Energy Information Administration highlighted in its latest Annual Energy Outlook, energy intensity in the U.S. has been declining for more than 30 years. If the current trend continues, U.S. energy intensity will decline by another 43% between 2012 and 2040. Even per capita energy consumption in America has declined since 2005. Energy efficiency programs on both the supply and demand side are credited as a major driver of these trends. As Dr. Brown mentioned, skeptics out there are always quick in pointing out that impressive achievement in the past means that most of the efficiency potential has been “tapped out” and what is left to us are costly and unpractical measures. In fact, these voices overlook an important factor: technology innovation. Because of technology innovation, we are able to have electric cars that can drive for 200 miles in a single charge (Tesla Model S), LED bulbs that use less than one-fifth of the energy demanded by incandescent bulbs but have a lifespan that is 15 times longer, and smart meters that can allow consumers to remotely turn on and off their home appliances based on real time electricity rates. The list of successful energy technology innovations can go on and on, but one thing that is worth noting is that innovation is better spurred when right policy incentives are put in place to promote and facilitate them. Improvements in energy efficiency will obviously reduce demand, but that’s not what “managing energy demand” usually means. “Managing energy demand” refers to active measures by the transmission system operator (TSO) to reduce demand when supply is short. One way to approach demand management is through what might be called “graceful emergency response”. That means TSO-commanded turnoff or setback of large industrial loads — typically building air conditioners — as a benign alternative to rolling blackouts. Another approach goes further, by allowing regular real-time control by the TSO of certain types of loads. Suitable loads have an inherent degree of flexibility as to when they run, and can operate at variable power levels. One example would be charging batteries in an energy storage unit. Minute-to-minute fine control of the power to such loads allows for what’s termed “load-based regulation” of voltage and frequency on the grid. Demand management of this sort is important as a cleaner and more economical alternative to fossil-fueled backing/peaking units for integrating intermittent renewable energy onto the grid. You noted that some assert that the future potential for energy efficiency is limited “because markets have already exploited all cost-effective opportunities.” Two points about that. First, cost-effectiveness in this case would be judged in terms of the time for avoided cost of energy to repay the capital cost of the efficiency improvement. The trouble is that the cost of energy that decision-makers see is artificially low, in that fossil fuels are not burdened with the external costs of their carbon emissions. If the fuels were taxed to internalize those costs, many efficiency improvements that are not currently judged so would suddenly become very cost-effective. The second point is that for energy savings potential, the most significant efficiency improvements tend to involve building design or urban infrastructure. They can be very cost-effective in new developments, but impossible or prohibitively expensive to retrofit into existing communities. They can and will be adopted, but only gradually as the rate of new construction permits. The vibrant discussion we are having on OurEnergyPolicy.org‘s forum clearly indicates that the potential of energy efficiency and demand response has not been fully exploited. Quite to the contrary, opportunities are expanding as we learn more about how to use energy smartly. The abundance of affordable natural gas is providing a “bridge fuel” to the future, which means we need to shift some attention, as Mr. Sid Abma points out, to combined heat and power and other ways of using gas more efficiently. CHP already accounts for 9% of the U.S. power capacity today, but it could do much more. As we retire much of our coal-fired equipment, new additions using technologies such as integrated gasification combined cycle and natural gas combined cycle could improve supply side efficiency, as well. Mr. Rodney Sobin and Ms. Jane Twitmyer both highlight several successful demand side programs that have led to the gradual decoupling of economic growth and energy consumption in the U.S. With clearly identified targeted markets and ever better technologies, designing smart policies becomes the crucial next step to ensure that we minimize the gap between the economically viable energy efficiency potential and the actual efficiency realized, i.e. the energy efficiency gap. Good EE policies should provide consumers with enough incentives to change their energy consuming and appliance purchase behavior as well as giving appliance manufacturers and power producers motivations to invest in new product innovation and efficiency upgrades. While setting the right level for standards has often been a guessing game, as Mr. Steve Isser points out, efficiency standards have generally been quite effective at reducing energy use. Mr. Rodney Sobin states that proposed standards for commercial refrigeration equipment, electric motors, and metal halide lamps show cost-effectiveness, but the political feasibility of new regulations are never certain despite assessments of favorable impacts. But contrary to the reassuring metrics of PhD students Sun and Watkins, from a global perspective, energy consumption is not stabilizing; it is increasing rapidly—at an annual rate of 1.5% according to the IEA. This is mainly due to the growing prosperity of China, India, the Middle East, and other developing countries that aspire to the lifestyles of the wealthiest nations. As a result, translating the demand management experience of industrialized countries into valuable lessons for the developing world should be a top priority. In addition, continuous technology and policy innovation in the U.S. is needed to realize our own energy efficiency potential in a cost effective way. Mr. Roger Arnold’s example of “load-based regulation” of voltage and frequency on the grid through minute-by-minute fine control of power to loads is an intriguing example of such possibilities.